With their base office in San Antonio, TX and a branch office in Austin, TX, Key Insulation has been installing insulation for over 10 years. Key Insulation provides a variety of choices for customers that meet the requirements for Green Building, ENERGY STAR® and beyond. 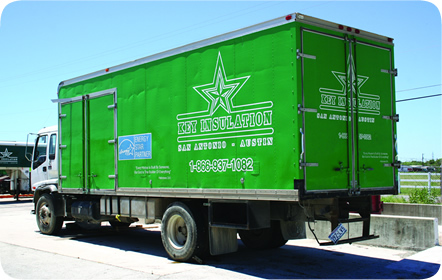 Key Insulation is one of our long-standing clients, so they came to us to design the wrap for their trucks. We used the same green and their logo to command attention from a distance. Including the Energy Star® logo was an essential part of the wrap, so we made sure that it could easily be seen by anyone and know they are knowledgeable when it comes to efficiency. We designed three individual folders to hold paperwork for the respective companies affiliated with Key Insulation. 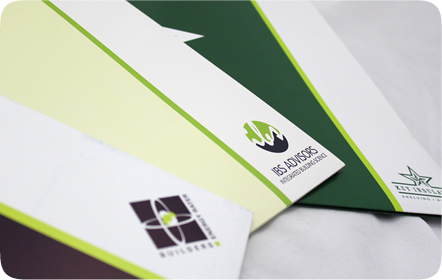 Each folder was designed to match the different logos in each company but still maintain a sense of continuity. We also created a set of three note cards with the respective logos on the front. 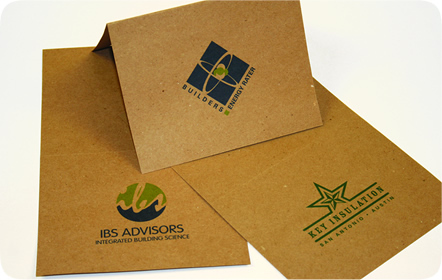 These cards were printed on brown recycled paper and were handed out as thank you cards to customers and clients.